Looking for a place to get your surf on while traveling the Caribbean? Lucky for you, the options are many -- and a lot easier to get to than Hawaii for most travelers. The Caribbean is a prime location for any surfer -- beginner, intermediate, advanced, and pure daredevils. From the Dominican Republic, which hosts 800 plus miles of coastline, to the varied waters off Jamaica, the Caribbean offers nearly every surf setting imaginable, and all accessible to visitors -- if you’re willing to do some exploring. Barbados is a great place for surfers who are looking to share in a vibe with the local surf scene. Barbados is known for hosting people from all over the world for surf contests and conventions. On the northwestern point of Barbados lies Duppies, a surf beach especially known for its easy-going atmosphere, small crowds, and local color. On the east coast, the Soup Bowl (near the town of Bathsheba) is more popular and has hosted international longboard competitions. On the south coast -- where the Atlantic and Pacific meet -- you’ll find Silver Sands Beach and Brian Talma, Barbados’ famous “Action Man.” Talma’s deAction Beach Shop is a great place to learn to surf (or kitesurf or windsurf), as is Boosy’s Surf School on the aptly named Surfer’s Bay. 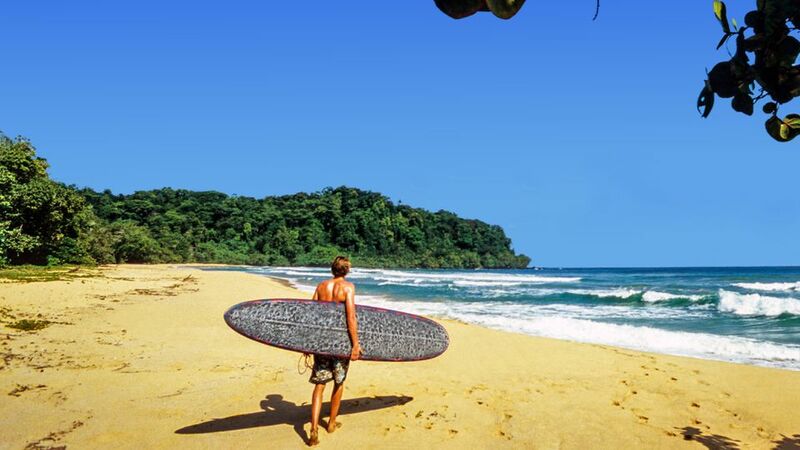 Costa Rica has been noted as having some of the best waves in the Caribbean, especially Puerto Viejo, located in the emerging tourist destination of Limon on Costa Rica’s southern Caribbean coast. For surfers, it's well worth the long flight (and a long drive from the airport in San Jose) to experience this Caribbean surfing mecca. If you’re a veteran to the art of surfing, the Dominican Republic may be your island of choice. It has by far the most mileage of coastline in the Caribbean and, being bordered by both the Atlantic and Caribbean Ocean, has destination surf spots year-round. In summer and spring, the southern part of the island nation is the place to go, while, alternatively, winter and fall are best spent in the north, especially in the Puerto Plata and Cabarete area. Another perk of the Dominican Republic is its flexibility: while it is a great location for standard longboard surfing, it also has locations the offer other surf-related recreation, such as La Boya on the Caribbean coast, which is great for beginner to advanced short-boarding. For beginners, Jamaica is a good place to start surfing. Not only are there a plethora of Jamaican surf camps up and down the coast, but if you plan on venturing out on your own, the waters are typically calm and easy to break into. Although not particularly known for its surf scene, Jamaica has a few places to catch some seriously sick swells -- the famous Zoo break-in Bull’s Bay was wiped out by a hurricane in 2004, but there are plenty of alternatives in the Kingston area, especially; the Lighthouse near the airport, for example, and Makka in the town of Yallah. If you want a more tourist-friendly atmosphere, Boston Bay -- the birthplace of Jamaican jerk cooking -- is one of the oldest surfing spots on the island, and well worth a visit. For U.S. citizens, Puerto Rico is the most easily accessible surfer's island, since it is a U.S. territory and no passport is required for visitors looking to catch some waves. Puerto Rico has hundreds of reefs, points, and beaches for surfing, making it a great place for family travel, especially because it is a densely populated tourist area. The east coast towns of Aguadilla and Rincon are the most popular destinations for surfers -- Rincon has some of the biggest and best waves in the Caribbean and is home to the acclaimed Rincon Surf School.